hello my lovelies and welcome to my very first 'real' outfit post, taken on my lovely brand new camera! I've been wanting to try these posts for a while, knowing I have a weird fashion sense which sometimes works out, sort of, okay! And this outfit was one of those outfits, styling a casual t-shirt with a skater skirt in the hope if looked a little more fancy. For christmas I asked my parents for some Disney t-shirts from TruffleShuffle...I've loved their site for years now and they bring out great graphic-tees ALL the time, so if you haven't before go check them out!? 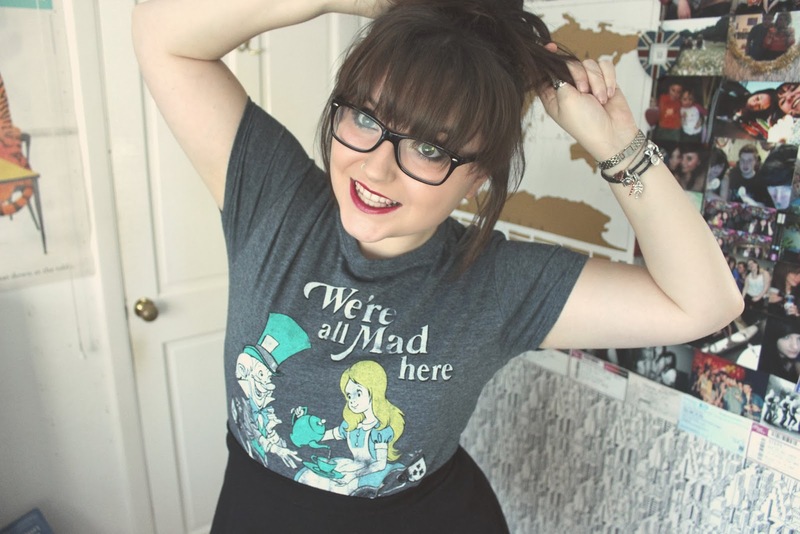 This 'Alice in Wonderland' tee was something I'd had my eye on for a while and was so happy on Christmas morning when I opened this. I love lounging around in legging's and t-shirts when I can stay indoors and when I'm just too lazy...and they're perfect quick outfits for the rushed mornings before heading to uni. Also I am a little mad so this t-shirt seems perfect for me, before heading for a little touch of shopping last week I realised I hadn't worn this great t-shirt out the house and thought it was the perfect time to try something different. I love the combination of childhood with Disney and the maturity and the 'blogger' inside of me with the skirt and slight heels in my shoes, showing that I'm trying but I'm just not 100% ready to grow up just yet. 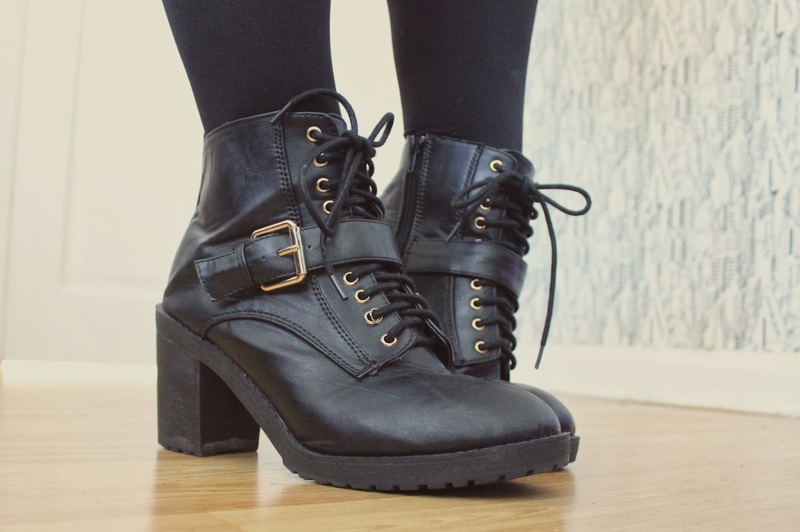 I brought this boots before christmas and I adore them, although I've probably worn them twice, oops!? These boots just bring out the rocker...or the goth inside of me as I've been told! I'd probably love and wear these 24/7 if they weren't heels...every time I buy and wear heeled boots I regret it so much as my poor feet end up in pain, but no pain, no gain right? I hope you liked my first outfit post, I hope I manage to get more done for you! Hopefully I have more posts coming for you in the next few weeks before my final semester at university starts back, ekkk!? Love that t-shirt. I completely adore truffleshuffle and I was lucky enough to get the 'I believe in fairies' tinkerbell t-shirt for Christmas. I've only work it to the gym so far, but may it needs a more dressed up outing. You may have just inspired me! You are so stinkin' cute! xo I'd love to see more of these! Awww your soooo sweet! I LOVE your top and its defo my kinda top! 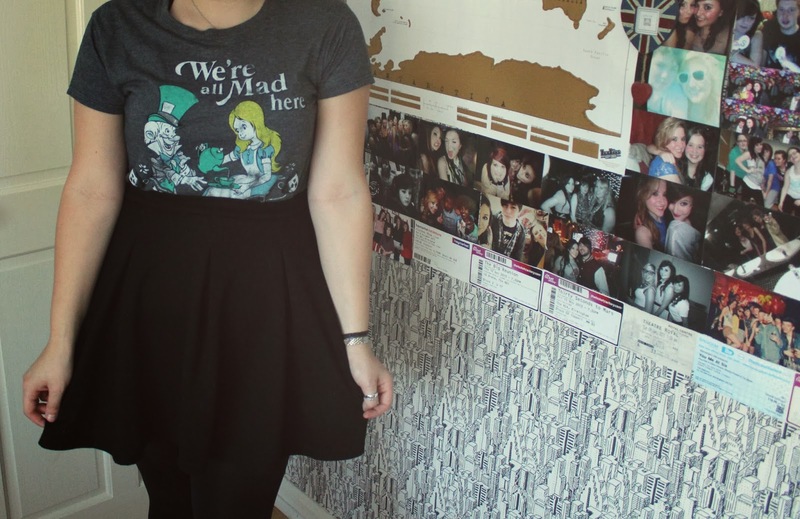 What a lovely outfit, I love t-shirts like your one and it goes really well when dressed up with a simple skater skirt. You're never too old for a bit of Disney right?! 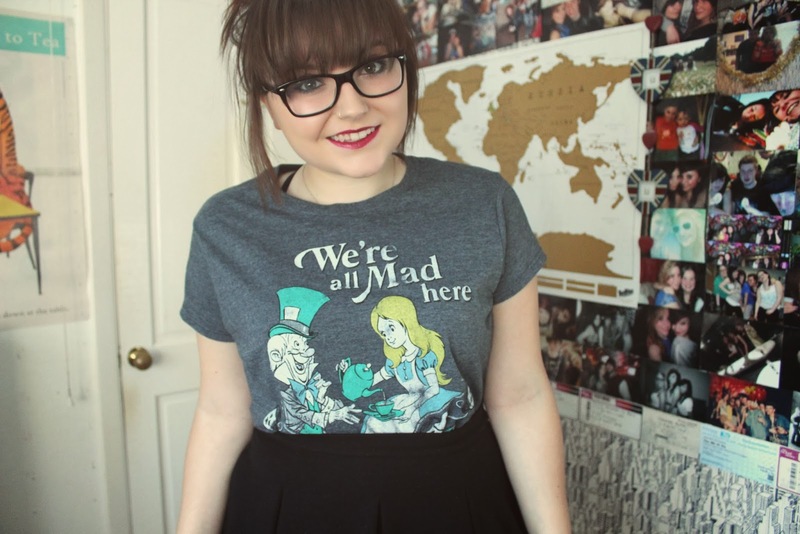 I love this T shirt, Alice in Wonderland is one of my favourite Disney films! I have a few tops from Truffle shuffle and I always have people mention how much they like them. Love your blog, I'm a new follower and I look forward to reading more from you! I love that t shirt so so so much! I love Alice in Wonderland! One of the best films! That's a seriously adorable shirt!